There’s a dangerous insect on the loose. 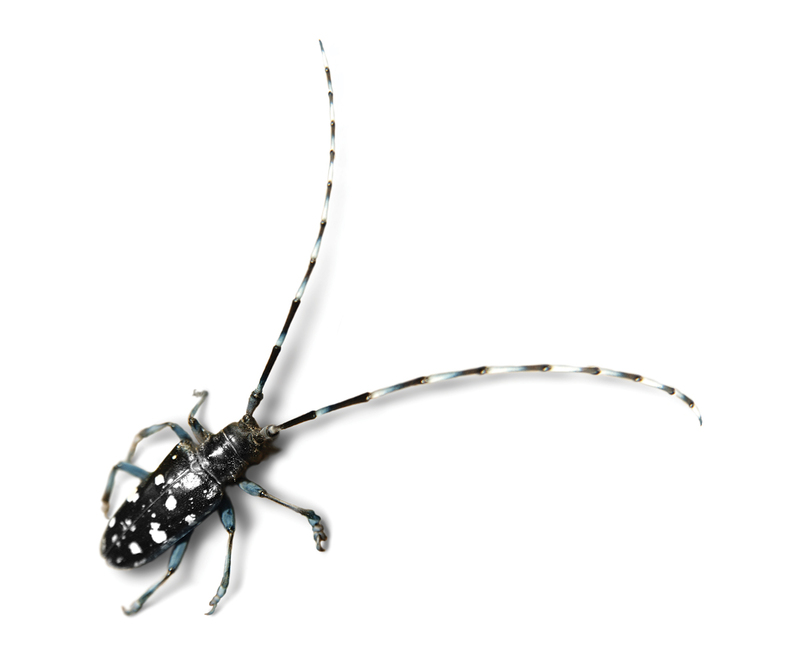 Shiny black with bright white spots, the non-native Asian longhorned beetle (or ALB for short) feeds on a wide range of trees to the point of destruction. Once infected, a tree can’t be saved; tens of thousands of trees have already been lost in the northern and central US. Now is the time to stop the ALB in its tracks. The insect is most active in August, which has prompted the USDA to launch Tree Check Month. Early detection is critical as the beetles can do immense damage in a short period of time. Ready to pitch in? Here’s what you need to know. Native to China, Japan, and Korea, the Asian long-horned beetle was first detected in North America in 1996. Most likely it hitchhiked aboard wooden packing material. Since then, it has destroyed over 80,000 trees in Massachusetts, New York, New Jersey, Ohio, and Illinois. Back in 2008, 27,000 infested trees had to be removed in Worcester alone. The ALB infests hardwood trees, such as maple, birch, horse chestnut, poplar, willow, elm, and ash. The beetle’s larvae burrow so deeply into the tree that insecticide won’t reach them, and it’s impossible to extract them. In the past, they have been reported in Greater Worcester and there was a small infestation in Boston. Fortunately, we can fight back. Eradication efforts have already banished the beetle from Illinois and New Jersey, and parts of New York are expected to follow soon. Small, perfectly round dime-sized holes (3/8″ up to 1/2″ in diameter) with smooth edges, left by adult beetles exiting a tree. Shallow oval scars in the bark (1/2″-3/4″ wide) where the eggs are deposited. Sawdust-like material on the ground and in branches, pushed out by the larvae as they burrow. The beetle itself. Mature ALBs measure 1 to 1.5 inches, with two antennae (the “horns”) that can grow up to 4 inches long. The USDA’s Asian longhorned beetle site features a slideshow of images (including ALB look-a-likes) and includes a tool to report sightings. This entry was posted in Get Involved and tagged alb, asian long-horned beetle, insects on August 5, 2013 by Rosemary. What are you supposed to do about it, that is if you find exit holes, etc. Have there been any reports of the Asian long-horned beetle on Cape Cod, MA?